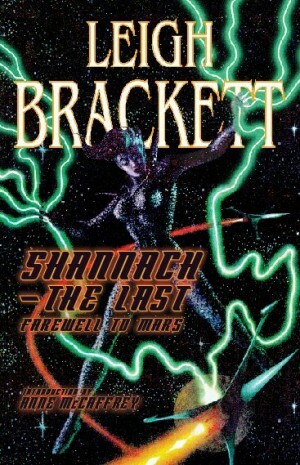 Picking up where Lorelei of the Red Mist: Planetary Romances left off, this volume collects the final 17 stories of strange adventures on other worlds from the undisputed “Queen of Space Opera.” Drawn from the last years of pulp magazines such as Planet Stories, Startling Stories, and digests magazines like Venture Science Fiction, Shannach – The Last: Farewell to Mars sees Brackett at the peak of her talents. Oddly, it is at this point where she abandons the “planetary romance” sub-genre and embarks on a small string of stories tinged with social relevance. This departure didn’t stop editors asking for some of “that old Brackett magic” and she offered up two latter day tales (“The Road to Sinharat” and “Purple Priestess of the Mad Moon”) before returning to chronicle further adventures of Eric John Stark in her final “Skaith” novels. Closing out the collection is a trio of tales written on commission from the “king of anthologies,” Roger Elwood. Grand Master Anne McCaffrey is writing the introduction. The book proudly displays Frank Kelly Freas’ vintage cover art with endpapers by Ed Emshwiller from the original pulp magazines.